The viscosity of a fluid is a measure of its resistance to deformation at a given rate. For liquids, it corresponds to the informal concept of "thickness": for example, syrup has a higher viscosity than water. A simulation of liquids with different viscosities. The liquid on the right has higher viscosity than the liquid on the left. Viscosity can be conceptualized as quantifying the frictional force that arises between adjacent layers of fluid that are in relative motion. For instance, when a fluid is forced through a tube, it flows more quickly near the tube's axis than near its walls. In such a case, experiments show that some stress (such as a pressure difference between the two ends of the tube) is needed to sustain the flow through the tube. This is because a force is required to overcome the friction between the layers of the fluid which are in relative motion: the strength of this force is proportional to the viscosity. A fluid that has no resistance to shear stress is known as an ideal or inviscid fluid. Zero viscosity is observed only at very low temperatures in superfluids. Otherwise, the second law of thermodynamics requires all fluids to have positive viscosity; such fluids are technically said to be viscous or viscid. A fluid with a relatively high viscosity, such as pitch, may appear to be a solid. The word "viscosity" is derived from the Latin "viscum", meaning mistletoe and also a viscous glue made from mistletoe berries. Illustration of a planar Couette flow. Since the shearing flow is opposed by friction between adjacent layers of fluid (which are in relative motion), a force is required to sustain the motion of the upper plate. The relative strength of this force is a measure of the fluid's viscosity. In a general parallel flow, the shear stress is proportional to the gradient of the velocity. In materials science and engineering, one is often interested in understanding the forces, or stresses, involved in the deformation of a material. For instance, if the material were a simple spring, the answer would be given by Hooke's law, which says that the force experienced by a spring is proportional to the distance displaced from equilibrium. Stresses which can be attributed to the deformation of a material from some rest state are called elastic stresses. In other materials, stresses are present which can be attributed to the rate of change of the deformation over time. These are called viscous stresses. For instance, in a fluid such as water the stresses which arise from shearing the fluid do not depend on the distance the fluid has been sheared; rather, they depend on how quickly the shearing occurs. Viscosity is the material property which relates the viscous stresses in a material to the rate of change of a deformation (the strain rate). Although it applies to general flows, it is easy to visualize and define in a simple shearing flow, such as a planar Couette flow. at the top. Each layer of fluid moves faster than the one just below it, and friction between them gives rise to a force resisting their relative motion. In particular, the fluid applies on the top plate a force in the direction opposite to its motion, and an equal but opposite force on the bottom plate. An external force is therefore required in order to keep the top plate moving at constant speed.
. It is a special case of the general definition of viscosity (see below), which can be expressed in coordinate-free form. can appear in nonshearing flows in addition to shearing flows. denotes the transpose. This equation can be thought of as a generalized form of Newton's law of viscosity. can be important is the calculation of energy loss in sound and shock waves, described by Stokes' law of sound attenuation, since these phenomena involve rapid expansions and compressions. It is worth emphasizing that the above expressions are not fundamental laws of nature, but rather definitions of viscosity. As such, their utility for any given material, as well as means for measuring or calculating the viscosity, must be established using separate means. is frequently called the dynamic viscosity or absolute viscosity, and has units force × time/area. direction from one fluid layer to the next. Per Newton's law of viscosity, this momentum flow occurs across a velocity gradient, and the magnitude of the corresponding momentum flux is determined by the viscosity. are the mass diffusivity and thermal conductivity. The fact that mass, momentum, and energy (heat) transport are among the most relevant processes in continuum mechanics is not a coincidence: these are among the few physical quantities that are conserved at the microscopic level in interparticle collisions. Thus, rather than being dictated by the fast and complex microscopic interaction timescale, their dynamics occurs on macroscopic timescales, as described by the various equations of transport theory and hydrodynamics. Viscosity, the slope of each line, varies among materials. Shear-thickening liquids, whose viscosity increases with the rate of shear strain. Shear-thinning liquids, whose viscosity decreases with the rate of shear strain. Thixotropic liquids, that become less viscous over time when shaken, agitated, or otherwise stressed. Rheopectic (dilatant) liquids, that become more viscous over time when shaken, agitated, or otherwise stressed. Bingham plastics that behave as a solid at low stresses but flow as a viscous fluid at high stresses. The Trouton ratio or Trouton's ratio is the ratio of extensional viscosity to shear viscosity. For a Newtonian fluid, the Trouton ratio is 3. Shear-thinning liquids are very commonly, but misleadingly, described as thixotropic. Even for a Newtonian fluid, the viscosity usually depends on its composition and temperature. For gases and other compressible fluids, it depends on temperature and varies very slowly with pressure. The viscosity of some fluids may depend on other factors. A magnetorheological fluid, for example, becomes thicker when subjected to a magnetic field, possibly to the point of behaving like a solid. However, many liquids (including water) will briefly react like elastic solids when subjected to sudden stress. Conversely, many "solids" (even granite) will flow like liquids, albeit very slowly, even under arbitrarily small stress. Such materials are therefore best described as possessing both elasticity (reaction to deformation) and viscosity (reaction to rate of deformation); that is, being viscoelastic. Indeed, some authors have claimed that amorphous solids, such as glass and many polymers, are actually liquids with a very high viscosity (greater than 1012 Pa·s). However, other authors dispute this hypothesis, claiming instead that there is some threshold for the stress, below which most solids will not flow at all, and that alleged instances of glass flow in window panes of old buildings are due to the crude manufacturing process of older eras rather than to the viscosity of glass. Viscoelastic solids may exhibit both shear viscosity and bulk viscosity. The extensional viscosity is a linear combination of the shear and bulk viscosities that describes the reaction of a solid elastic material to elongation. It is widely used for characterizing polymers. In geology, earth materials that exhibit viscous deformation at least three orders of magnitude greater than their elastic deformation are sometimes called rheids. Viscosity is measured with various types of viscometers and rheometers. A rheometer is used for those fluids that cannot be defined by a single value of viscosity and therefore require more parameters to be set and measured than is the case for a viscometer. Close temperature control of the fluid is essential to acquire accurate measurements, particularly in materials like lubricants, whose viscosity can double with a change of only 5 °C. For some fluids, the viscosity is constant over a wide range of shear rates (Newtonian fluids). The fluids without a constant viscosity (non-Newtonian fluids) cannot be described by a single number. 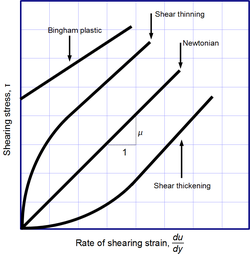 Non-Newtonian fluids exhibit a variety of different correlations between shear stress and shear rate. One of the most common instruments for measuring kinematic viscosity is the glass capillary viscometer. In coating industries, viscosity may be measured with a cup in which the efflux time is measured. There are several sorts of cup – such as the Zahn cup and the Ford viscosity cup – with the usage of each type varying mainly according to the industry. The efflux time can also be converted to kinematic viscosities (centistokes, cSt) through the conversion equations. Also used in coatings, a Stormer viscometer uses load-based rotation in order to determine viscosity. The viscosity is reported in Krebs units (KU), which are unique to Stormer viscometers. Vibrating viscometers can also be used to measure viscosity. Resonant, or vibrational viscometers work by creating shear waves within the liquid. In this method, the sensor is submerged in the fluid and is made to resonate at a specific frequency. As the surface of the sensor shears through the liquid, energy is lost due to its viscosity. This dissipated energy is then measured and converted into a viscosity reading. A higher viscosity causes a greater loss of energy. Extensional viscosity can be measured with various rheometers that apply extensional stress. Volume viscosity can be measured with an acoustic rheometer. Apparent viscosity is a calculation derived from tests performed on drilling fluid used in oil or gas well development. These calculations and tests help engineers develop and maintain the properties of the drilling fluid to the specifications required. The SI unit of dynamic viscosity is the pascal-second (Pa·s), or equivalently kilogram per meter per second (kg·m−1·s−1). The CGS unit is called the poise (P), named after Jean Léonard Marie Poiseuille. It is commonly expressed, particularly in ASTM standards, as centipoise (cP) since the latter is equal to the SI multiple millipascal seconds (mPa·s). The SI unit of kinematic viscosity is square meter per second (m2/s), whereas the CGS unit for kinematic viscosity is the stokes (St), named after Sir George Gabriel Stokes. In U.S. usage, stoke is sometimes used as the singular form. The submultiple centistokes (cSt) is often used instead. , depending on the convention used, measured in reciprocal poise (P−1, or cm·s·g−1), sometimes called the rhe. Fluidity is seldom used in engineering practice. Nonstandard units include the reyn, a British unit of dynamic viscosity. In the automotive industry the viscosity index is used to describe the change of viscosity with temperature. At one time the petroleum industry relied on measuring kinematic viscosity by means of the Saybolt viscometer, and expressing kinematic viscosity in units of Saybolt universal seconds (SUS). Other abbreviations such as SSU (Saybolt seconds universal) or SUV (Saybolt universal viscosity) are sometimes used. Kinematic viscosity in centistokes can be converted from SUS according to the arithmetic and the reference table provided in ASTM D 2161. In general, the viscosity of a system depends in detail on how the molecules constituting the system interact. There are no simple but correct expressions for the viscosity of a fluid. The simplest exact expressions are the Green–Kubo relations for the linear shear viscosity or the transient time correlation function expressions derived by Evans and Morriss in 1985. Although these expressions are each exact, calculating the viscosity of a dense fluid using these relations currently requires the use of molecular dynamics computer simulations. On the other hand, much more progress can be made for a dilute gas. Even elementary assumptions about how gas molecules move and interact lead to a basic understanding of the molecular origins of viscosity. More sophisticated treatments can be constructed by systematically coarse-graining the equations of motion of the gas molecules. An example of such a treatment is Chapman–Enskog theory, which derives expressions for the viscosity of a dilute gas from the Boltzmann equation. Momentum transport in gases is generally mediated by discrete molecular collisions, and in liquids by attractive forces which bind molecules close together. Because of this, the dynamic viscosities of liquids are typically much larger than those of gases. coordinate. To simplify the discussion, the gas is assumed to have uniform temperature and density. itself should increase with temperature and be independent of density at fixed temperature. In fact, both of these predictions persist in more sophisticated treatments, and accurately describe experimental observations. Note that this behavior runs counter to common intuition regarding liquids, for which viscosity typically decreases with temperature. depends on temperature in a non-trivial way, and simple kinetic arguments as used here are inadequate. More fundamentally, the notion of a mean free path becomes imprecise for particles that interact over a finite range, which limits the usefulness of the concept for describing real-world gases. for more realistic molecular models, such as those incorporating intermolecular attraction rather than just hard-core repulsion. as a simple interpolation which is valid for some gases over fixed ranges of temperature, but otherwise does not provide a picture of intermolecular interactions which is fundamentally correct and general. Slightly more sophisticated models, such as the Lennard–Jones potential, may provide a better picture, but only at the cost of a more opaque dependence on temperature. In some systems the assumption of spherical symmetry must be abandoned as well, as is the case for vapors with highly polar molecules like H2O. for a monatomic ideal gas, in which the internal energy of molecules in negligible, but is nonzero for a gas like carbon dioxide, whose molecules possess both rotational and vibrational energy. In contrast with gases, there is no simple yet accurate picture for the molecular origins of viscosity in liquids. At the simplest level of description, the relative motion of adjacent layers in a liquid is opposed primarily by attractive molecular forces acting across the layer boundary. In this picture, one (correctly) expects viscosity to decrease with increasing temperature. This is because increasing temperature increases the random thermal motion of the molecules, which makes it easier for them to overcome their attractive interactions. are constants fit from data. One the other hand, several authors express caution with respect to this model. Errors as large as 30% can be encountered using equation (1), compared with fitting equation (2) to experimental data. More fundamentally, the physical assumptions underlying equation (1) have been extensively criticized. It has also been argued that the exponential dependence in equation (1) does not necessarily describe experimental observations more accurately than simpler, non-exponential expressions. In light of these shortcomings, the development of a less ad-hoc model is a matter of practical interest. Foregoing simplicity in favor of precision, it is possible to write rigorous expressions for viscosity starting from the fundamental equations of motion for molecules. A classic example of this approach is Irving-Kirkwood theory. On the other hand, such expressions are given as averages over multiparticle correlation functions and are therefore difficult to apply in practice. In general, empirically derived expressions (based on existing viscosity measurements) appear to be the only consistently reliable means of calculating viscosity in liquids. which reasonably match experimental data, the collisional integrals typically must be evaluated using some combination of analytic calculation and empirical fitting. An example of such a procedure is the Sutherland approach for the single-component gas, discussed above. are the respective mole fractions and viscosities of the component liquids. Since blending is an important process in the lubricating and oil industries, a variety of empirical and propriety equations exist for predicting the viscosity of a blend, besides those stemming directly from molecular theory.
. This deficiency has been attributed to difficulty in controlling experimental conditions. for spheres), or in suspensions of elongated or flexible particles. There is a distinction between a suspension of solid particles, described above, and an emulsion. The latter is a suspension of tiny droplets, which themselves may exhibit internal circulation. The presence of internal circulation can noticeably decrease the observed effective viscosity, and different theoretical or semi-empirical models must be used. where Q is a relevant activation energy, given in terms of molecular parameters; T is temperature; R is the molar gas constant; and A is approximately a constant. The activation energy Q takes a different value depending on whether the high or low temperature limit is being considered: it changes from a high value QH at low temperatures (in the glassy state) to a low value QL at high temperatures (in the liquid state). are all constants, provides a good fit to experimental data over the entire range of temperatures, while at the same time reducing to the correct Arrhenius form in the low and high temperature limits. Besides being a convenient fit to data, the expression can also be derived from various theoretical models of amorphous materials at the atomic level. In the study of turbulence in fluids, a common practical strategy is to ignore the small-scale vortices (or eddies) in the motion and to calculate a large-scale motion with an effective viscosity, called the "eddy viscosity", which characterizes the transport and dissipation of energy in the smaller-scale flow (see large eddy simulation). In contrast to the viscosity of the fluid itself, which must be positive by the second law of thermodynamics, the eddy viscosity can be negative. 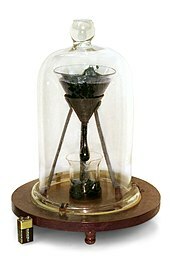 In the University of Queensland pitch drop experiment, pitch has been dripping slowly through a funnel since 1927, at a rate of one drop roughly every decade. In this way the viscosity of pitch has been determined to be approximately 230 billion (7011229999999999999♠2.3×1011) times that of water. Observed values of viscosity vary over several orders of magnitude, even for common substances. For instance, a 70% sucrose (sugar) solution has a viscosity over 400 times that of water, and 26000 times that of air. More dramatically, pitch has been estimated to have a viscosity 230 billion times that of water. where A = 6995241400000000000♠2.414×10−5 Pa·s, B = 247.8 K, and C = 140 K.
Experimentally determined values of the viscosity at various temperatures are given below. Under standard atmospheric conditions (25 °C and pressure of 1 bar), the viscosity of air is 18.5 μPa·s, roughly 50 times smaller than the viscosity of water at the same temperature. Except at very high pressure, the viscosity of air depends mostly on the temperature. ^ a b These materials are highly non-Newtonian. ^ Symon, Keith (1971). Mechanics (3rd ed.). Addison-Wesley. ISBN 978-0-201-07392-8. ^ "viscous". Etymonline.com. Retrieved 2010-09-14. ^ Jan Mewis; Norman J. Wagner (2012). Colloidal Suspension Rheology. Cambridge University Press. p. 19. ISBN 978-0-521-51599-3. ^ Streeter, Victor Lyle; Wylie, E. Benjamin; Bedford, Keith W. (1998). Fluid Mechanics. McGraw-Hill. ISBN 978-0-07-062537-2. ^ Holman, J. P. (2002). Heat Transfer. McGraw-Hill. ISBN 978-0-07-122621-9. ^ Incropera, Frank P.; DeWitt, David P. (2007). Fundamentals of Heat and Mass Transfer. Wiley. ISBN 978-0-471-45728-2. ^ Nič, Miloslav; Jirát, Jiří; Košata, Bedřich; Jenkins, Aubrey, eds. (1997). "dynamic viscosity, η". IUPAC Compendium of Chemical Terminology. Oxford: Blackwell Scientific Publications. doi:10.1351/goldbook. ISBN 978-0-9678550-9-7. ^ Daniel V. Schroeder (1999). An Introduction to Thermal Physics. Addison Wesley. ISBN 978-0-201-38027-9. ^ Jan Mewis; Norman J. Wagner (2012). Colloidal Suspension Rheology. Cambridge University Press. pp. 228–230. ISBN 978-0-521-51599-3. ^ Kumagai, Naoichi; Sasajima, Sadao; Ito, Hidebumi (15 February 1978). "Long-term Creep of Rocks: Results with Large Specimens Obtained in about 20 Years and Those with Small Specimens in about 3 Years". Journal of the Society of Materials Science (Japan). 27 (293): 157–161. Retrieved 2008-06-16. ^ Elert, Glenn. "Viscosity". The Physics Hypertextbook. ^ Gibbs, Philip. "Is Glass a Liquid or a Solid?". Retrieved 2007-07-31. ^ Plumb, Robert C. (1989). "Antique windowpanes and the flow of supercooled liquids". Journal of Chemical Education. 66 (12): 994. Bibcode:1989JChEd..66..994P. doi:10.1021/ed066p994. ^ Scherer, George W.; Pardenek, Sandra A.; Swiatek, Rose M. (1988). "Viscoelasticity in silica gel". Journal of Non-Crystalline Solids. 107 (1): 14. Bibcode:1988JNCS..107...14S. doi:10.1016/0022-3093(88)90086-5. ^ "Poise". IUPAC definition of the Poise. 2009. doi:10.1351/goldbook.P04705. ISBN 978-0-9678550-9-7. Retrieved 2010-09-14. ^ Gyllenbok, Jan (2018). "Encyclopaedia of Historical Metrology, Weights, and Measures". Encyclopaedia of Historical Metrology, Weights, and Measures, Volume 1. Birkhäuser. p. 213. ISBN 9783319575988. ^ "Quantities and Units of Viscosity". Uniteasy.com. Retrieved 2010-09-14. ^ Evans, Denis J.; Morriss, Gary P. (October 15, 1988). "Transient-time-correlation functions and the rheology of fluids". Physical Review A. 38 (8): 4142–4148. Bibcode:1988PhRvA..38.4142E. doi:10.1103/PhysRevA.38.4142. PMID 9900865. ^ The discussion which follows draws from Chapman & Cowling, pp. 232-237. ^ a b Mueller, S.; Llewellin, E. W.; Mader, H. M. (2009). "The rheology of suspensions of solid particles". Proceedings of the Royal Society A: Mathematical, Physical and Engineering Sciences. 466 (2116): 1201–1228. doi:10.1098/rspa.2009.0445. ISSN 1364-5021. ^ Fluegel, Alexander. "Viscosity calculation of glasses". Glassproperties.com. Retrieved 2010-09-14. ^ Doremus, R. H. (2002). "Viscosity of silica". J. Appl. Phys. 92 (12): 7619–7629. Bibcode:2002JAP....92.7619D. doi:10.1063/1.1515132. ^ Ojovan, M. I.; Lee, W. E. (2004). "Viscosity of network liquids within Doremus approach". J. Appl. Phys. 95 (7): 3803–3810. Bibcode:2004JAP....95.3803O. doi:10.1063/1.1647260. ^ a b Ojovan, M. I.; Travis, K. P.; Hand, R. J. (2000). "Thermodynamic parameters of bonds in glassy materials from viscosity-temperature relationships". J. Phys. : Condens. Matter. 19 (41): 415107. Bibcode:2007JPCM...19O5107O. doi:10.1088/0953-8984/19/41/415107. PMID 28192319. ^ Marcel Lesieur (6 December 2012). Turbulence in Fluids: Stochastic and Numerical Modelling. Springer Science & Business Media. pp. 2–. ISBN 978-94-009-0533-7. ^ Sivashinsky, V.; Yakhot, G. (1985). "Negative viscosity effect in large-scale flows". 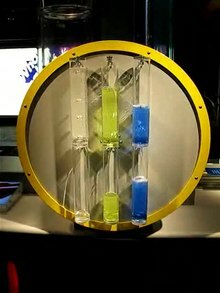 The Physics of Fluids. 28 (4): 1040. doi:10.1063/1.865025. ^ a b c Edgeworth, R.; Dalton, B. J.; Parnell, T. (1984). "The pitch drop experiment". European Journal of Physics. 5 (4): 198–200. Bibcode:1984EJPh....5..198E. doi:10.1088/0143-0807/5/4/003. Retrieved 2009-03-31. ^ a b c John R. Rumble, ed. (2018). CRC Handbook of Chemistry and Physics (99th ed.). Boca Raton, FL: CRC Press. ISBN 978-1138561632. ^ Yanniotis, S.; Skaltsi, S.; Karaburnioti, S. (February 2006). 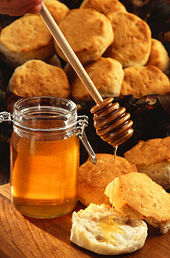 "Effect of moisture content on the viscosity of honey at different temperatures". Journal of Food Engineering. 72 (4): 372–377. doi:10.1016/j.jfoodeng.2004.12.017. Bird, R. Byron; Stewart, Warren E.; Lightfoot, Edwin N. (2007), Transport Phenomena (2nd ed. ), John Wiley & Sons, Inc., ISBN 978-0-470-11539-8 . A standard, modern reference. Daniel V. Schroeder (1999), An Introduction to Thermal Physics, Addison Wesley, ISBN 978-0-201-38027-9 . A brief, elementary treatment. Reif, F. (1965), Fundamentals of Statistical and Thermal Physics, McGraw-Hill . An advanced treatment. Landau, L.D. ; Lifshitz, E.M. (1987), Fluid Mechanics (2nd ed. ), Pergamon Press, ISBN 978-0-08-033933-7 . A classic reference. Balescu, Radu (1975), Equilibrium and Nonequilibrium Statistical Mechanics, John Wiley & Sons, ISBN 978-0-471-04600-4 . Chapman, Sydney; Cowling, T.G. (1970), The Mathematical Theory of Non-Uniform Gases (3rd ed. ), Cambridge University Press . A very advanced but classic text on the theory of transport processes in gases. Jan Mewis; Norman J. Wagner (2012). Colloidal Suspension Rheology. Cambridge University Press. ISBN 978-0-521-51599-3. Focuses on non-Newtonian phenomenology. Bird, R. Bryon; Armstrong, Robert C.; Hassager, Ole (1987), Dynamics of Polymeric Liquids, Volume 1: Fluid Mechanics (2nd ed. ), John Wiley & Sons . Look up viscosity in Wiktionary, the free dictionary. Wikisource has the text of The New Student's Reference Work article "Viscosity of Liquids".